Daly, A. J. (Ed.). (2010). 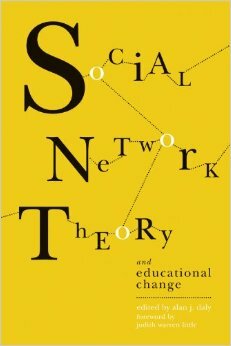 Social network theory and educational change. Cambridge, Mass. : Harvard Education Press. As part of my research this fall, I am making my way through this 2010 primer on Social Network Theory. I am going to try to blog summaries and reactions as a way to understand what I’m reading. The big questions I’ve had over the past few years have all, in one way or another, been related to understanding “change trajectories,” to use a term that Judith Little uses in the Forward (p.xiii). I’ve observed top-down change be inspiring but ineffective at changing classrooms and bottom-up change also be inspiring but fade when the individual runs out of steam or moves on. This has drawn me to educational change that is facilitated by networks, where individual work moves toward a common goal in a way that feels coordinated and supported. My big question: How do we understand educational change trajectories? “Organizations are inherently relational. They are social systems consisting of people with differing interests, goals, and preferences, interacting, communicating, and making decisions” (p.29). It’s amazing how often this is ignored by proponents of a particular program who want to focus the product or goal rather than the relationships. I think what appeals to me in particular about SNT is the ability to use it’s theory and method at all levels and phases, whether it is situated practice, district curriculum goals, student graduation rater, etc. Our networks impact everything we do – it is the interstitial human stuff – and our “positions in a social structure have consequences” (p.17). Network: “a group o factors who are connected to one another through a set of different relations or ties, often called channels” (p.4). Channels: “pipes” through which communication, knowledge, innovation, or other resources flow. Social capital: “resources embedded in social relations and social structure which can be mobilized when an actor wishes to increase the likelihood of success in purposive action” (Nan Lin, quoted on page 4) This term has many nuances in the research literature. Strong ties: generally close, tend to be homophilic, “support transfer of tacit, nonroutine, and complex knowledge” (p.4). –> As an interesting aside, I’m also reading Linked, by Albert-Laszlo Barabasi, and he talks about Mark Granovetter’s idea of the “strength of weak ties.” (Barabasi, p.43) This was the observation that in most people’s social world, your strong ties are a collection of close friends whom you are all in close connection with each other, so everyone generally knows what each individual knows. The weak ties, however, play a crucial role in communicating with the world outside, such as getting a job, flow of new ideas, etc. because those ties tend to connect us with people less like us. Table 2-1 helped me break down the different types of relations that individual “nodes” might have and what I might be interested in researching. I’m interested in information flows, particularly when innovative ideas reach someone but don’t get implemented. 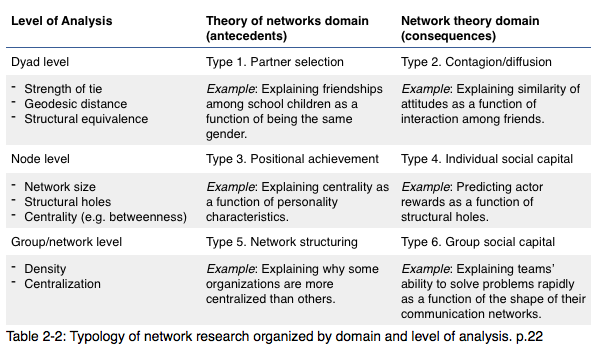 Using social network theory might be the first step in identifying the ties that exist. Interesting to note that “a node’s structural position in a network determines in part the opportunities and constraints it will encounter” (p.20). These two foundation chapters will help me understand the analysis of the next chapters of analysis of network based research. Could a social network analysis (SNA) be applied as one piece of a bigger study? If so, how well do results from SNA work within other epistemological frameworks? 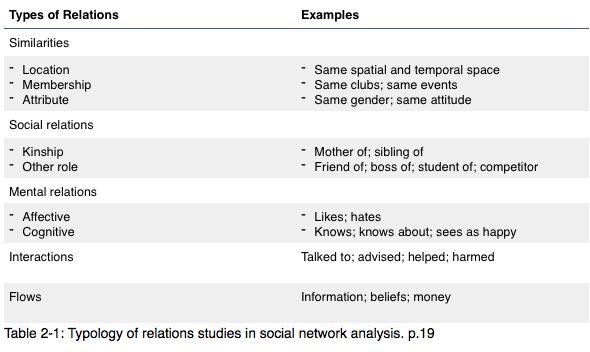 The tables I copied here make it feel like the field of Social Network Theory is very clean and neatly defined, but that is not usually my experience of research. Do researchers define themselves as “Social network theorists?” What departments are they usually in? (Alan Daly, the editor of this book, is a faculty member in Education Studies at UC-San Diego.) How do goal oriented networks create ties between individuals?